Rob Barnett’s recent review of a disc of songs by Stephen Wilkinson reminded me of this earlier disc on which he himself conducts what I’m sure is a hand-picked ensemble of singers in a number of his pieces for unaccompanied choir. The choir numbers 21 (5/4/5/7) and includes a number of names well known to me either as members of elite ensembles such as The Sixteen or as successful soloists in their own right. Among them are two of the singers who feature on the more recent disc of songs: the bass, Mathew Brook and the mezzo-soprano, Claire Wilkinson who is the composer’s daughter. In the booklet Stephen Wilkinson acknowledges that this project was his daughter’s idea in the first place. I presume the recordings were made to mark Stephen Wilkinson’s 90th birthday in 2009. 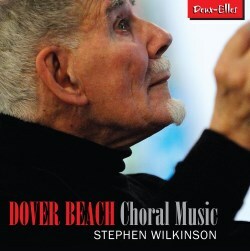 I well remember Stephen Wilkinson’s work with the BBC Northern Singers from my days growing up in the north of England. He worked with this ensemble from the mid-1950s until 1993; latterly their BBC connection had been severed and they were known as the Britten Singers. Wilkinson was also the first conductor, from 1970, of the William Byrd Singers, based in Manchester. He retired from that role in 2009 at the age of 90. He also worked extensively with other leading choirs during his career and gained a reputation for training and conducting choirs in new and contemporary music. It’s this distinguished pedigree that he brings to this disc of his own music and it might fairly be surmised that few composers would have a better understanding of how choirs work. The programme includes a number of folk song arrangements, all of which are very enterprising. I was almost taken aback by The Sheep under the Snow which tells of the tragic loss in a severe snowstorm in 1705 of sheep flocks on the Isle of Man. Of course, the loss of the sheep meant loss of livelihood. In the first two verses, the sound of the wordless voices around the narrative tune graphically suggests the howling storm winds. There’s real sadness in the setting of verse three which tells of the discovery of the buried dead sheep. As folk song arrangements go this is a tough proposition: it’s compelling. By contrast, The Piper o’ Dundee is witty and jolly; I could easily envisage this as an encore piece. As I Walked Out is a Welsh tune. Actually, two tunes are embedded here in a very beautiful and ingenious arrangement. Three Elegies consists of settings of poems by Ben Jonson, Mary Coleridge and Kathleen Raine. These are complex settings and, to be frank, I found that whilst I respected the pieces the music didn’t really draw me in. That, however, is a failing on my part, not the composer’s. I’m not entirely clear if the Three Psalms were composed as a set or have been grouped together for this recording. They’re very accomplished settings. Psalm 67 begins with vigorously contrapuntal music. Later, when the psalmist speaks of the time when ‘the earth bring[s] forth her increase’ Wilkinson says that he envisions this as “a super Harvest Festival with bath-size marrows”. However, in keeping with the words, the mood of the music becomes more uncertain at the end where the harmonies are most interesting. Psalm 148 is described by the composer as a “riotous eulogy”. The music, which is extrovert, sounds extremely challenging for the choir though these expert singers are not fazed by it at all. These three psalm settings make a strong impression on the listener though so chromatic are the harmonies that I really couldn’t get a sense of key. I hasten to add that that last point is an observation, not a criticism. Betjeman’s Bells sets three poems by the former Poet Laureate in which the subject of bells is addressed in different ways. The middle poem, ‘Uffington’ describes the ringing of the church bells in an evening to denote the death of a villager. Wilkinson’s expertly-wrought music conveys the sadness of the moment. The outer two settings, he says, are both “landscapes” in which the poem conveys imagery of bells heard across a rural scene. I admire the several ways in which Wilkinson depicts the sound of bells in music without ever resorting to trite ways. That Time of Year is a setting of Shakespeare’s Sonnet 73 for baritone or bass solo with mainly wordless choir. Here the soloist is the admirable Matthew Brook. It was good programme planning to follow it with a second Shakespeare piece. Wilkinson’s response to the famous lines ‘When icicles hang by the wall’ is lively, colourful and cheerful; it’s the perfect contrast to the seriousness of the preceding Sonnet setting. The programme closes with a setting of Mathew Arnold’s famous Dover Beach. Like That Time of Year this is a very serious piece. Wilkinson’s music is searching and requires expert singing, which it duly receives. The music on this CD is challenging for the performers and for the listener. When I say it challenges the listener I do not mean that it is discordant or that it requires the singers to make egregious vocal noises. Wilkinson is far too clever for that. However, his harmonic writing is often complex, as are his textures. In short, this is music that requires great concentration by the listener. However, that concentration will be rewarded. It helps enormously that the pieces are here sung by a group of highly expert singers so the harmonies and the lines are always clear – as are the words. Furthermore, the music is sung with great conviction. I referred earlier to Stephen Wilkinson’s long experience as a choral conductor and trainer. He has an understanding of choirs from the inside that is probably unrivalled and it shows, not just in the quality of his writing but also in the committed performances that he gets from his forces. At the age of 90 he was still clearly a force to be reckoned with when standing in front of a group of singers. The recording itself is very good: the choir emerges with presence and clarity. Stephen Wilkinson himself has written the notes about the pieces. These are succinct and exhibit a dry wit which I like. My only regret is that the documentation doesn’t tell us when the individual pieces were composed.